Cat's adventures are always fun and exciting. This blue can has one and he has a secret weapon. A huge big glove as a weapon that he can use in order to climb up or hit his enemies from the distance! 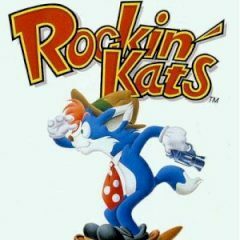 Rockin' Kats won't let you get bothered so you better join their adventure now! Turn the TV on and choose the channel you like most. Don't worry, they are being shown on all channels, so you should only choose the story you want to experience. Get on the street and fight your enemies with a mighty glove and find out where the lady is!